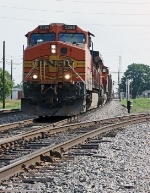 Description: Heatwaves ripple the scene as BNSF 5286 speeds train Z-WSPALT9-18B past the south siding switch in Moore. Description: BNSF 5286 trails on Q64914. Description: Burlington Northern Santa Fé. # 5286 southbound on Union Pacific track #1 after crossing Morning Dr / CA-184. Description: NS 17K departs Bellevue Yard with a pair of BNSF Dash 9's. Description: The BNSF C44-9W 5286 pulles by the watertower at Litchfield awaiting to meet the BNSF SD75M 8264 on 8-27-2010. Description: BNSF 5286 leads a stack train west through Highlands. Description: Five-pack motoring to its train while the single unit is a DPU. The coil car is a bad order. Description: BNSF 5286 and helper move a tainload of J. B. Hunt trailers westbound. Description: Burlington Northern Santa Fé. # 5286 eastbound track# 2 approaching the N St crossing. Description: An eastbound all tank car train heads past the Lynxville Lock and Dam.